Several protesters from the Sinhala and Tamil Diaspora attempted to disrupt Prime Minister Ranil Wickremesinghe's law oration at the Deakin Law School yesterday (16). Prime Minister Ranil Wickremesinghe, who had been invited to provide the annual law oration at the Law School of Deakin University – same University that conferred on him an honorary Doctorate earlier this week – at the Deakin Edge, Federation Square in Melbourne. There the Premier spoke about free navigation in the Indian Ocean, something which he claimed to be an unexplored area in Law. Prior to the commencement of the event, two groups of protesters occupied the immediate exterior of the Deakin Edge Hall and it's adjacent road, blocking the paths and holding up banners and flags in protest. Media observed that two groups of protesters were present at the venue peacefully demonstrating against two different topics. 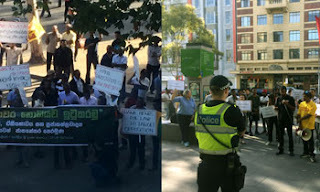 The Sinhala Diaspora in Melbourne, Australia who had occupied the road connecting to the Deakin Hall protested against the current government's plans to bring about a federalist system through a supposed new Constitution. Meanwhile, the Tamil Diaspora group in Melbourne protested against the Premier, as well as the Deakin University. One slogan read, "Deakin University, do not award war criminals." Reporters also observed an individual wielding the red flag of the Liberation Tamil Tigers Eelam among the protesters. Media covering the event were discouraged from taking photographs or video footage of the protests. Prime Minister Wickremesinghe, unfazed by the protests, carried on with his oration amidst cries of protest outside. Later, he and his delegation attended a dinner organized by the university private members board. The Prime Minister will leave Melbourne today, ending his official visit. He is expected back in Colombo on Saturday (18).